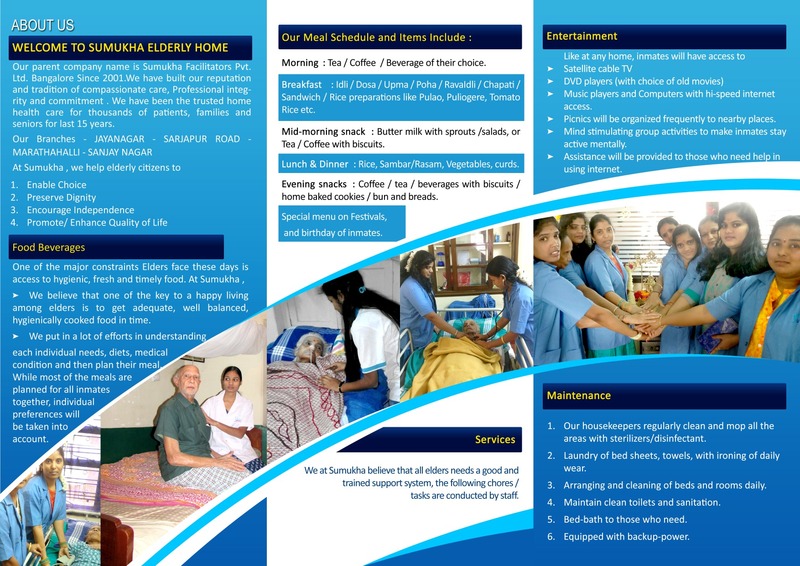 Sumukha Nursing Services is a leading home care provider in Bangalore and other parts of country since 2001.Our parent company name is Sumukha Facilitators Pvt. Ltd...Our Branches Jayanagar- Sarjapur Road- Marathahalli. Sumukha Nursing Services is a leading home care provider in Bangalore and other parts of country since 2001.Our parent company name is Sumukha Facilitators Pvt. Ltd...We have built our reputation and tradition of compassionate care, Professional integrity and commitment. We have been the trusted home health care for thousands of patients, families and seniors for last 15 years. Our mission is to bring high standard and quality nursing services to homes, Communities at affordable and accessible to all. We desire to transform the home nursing services based on personal and trusted relationship. Our objective is to provide nursing services based on qualitative & comprehensive care to the patients, Maximum comfort and happiness by way of pleasant surroundings. Formulate a personal and professional ethical framework to conduct professional nursing.